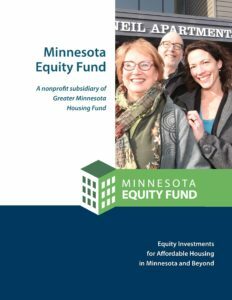 Minnesota Equity Fund (MEF) is a social enterprise designed to raise equity capital from corporations and banks to invest in well designed, high quality, sustainable affordable housing developments throughout Minnesota and in other target markets. MEF is a joint venture of the Greater Minnesota Housing Fund with Cinnaire, a community development financial partner with a proven track record of investment management, underwriting, asset management, and SEC, HUD, and IRS compliance. MEF provides equity investments for a full range of affordable housing development in Minnesota and beyond. MEF and Cinnaire seek to invest in affordable housing in Minnesota, Wisconsin, Illinois, Indiana, Michigan, New York, Pennsylvania, Delaware, Maryland, and Mississippi. Greater Minnesota Housing Fund (GMHF) is Minnesota’s leading nonprofit affordable housing lender, having awarded over $250 million in its 20-year history, financing over 13,200 units of affordable housing and leveraging more than $1 billion in additional capital investments. GMHF established its tax credit investment subsidiary, Minnesota Equity Fund (MEF), in 2012. GMHF operates a $42 million development loan fund providing predevelopment, acquisition, construction, bridge, and first mortgage financing for affordable housing throughout Minnesota. GMHF is certified by the Department of Treasury as a Community Development Financial Institution (CDFI) and is a member of the Federal Home Loan Bank of Des Moines. GMHF is rated AAA+2 by Aeris. Find more information. Cinnaire is a full-service community development financial partner with equity funds in ten states. Cinnaire has invested over $2.5 billion in housing and community developments and has financed over 500 developments and 25,000 housing units. Cinnaire supports community stabilization and economic development by developing and nurturing partnerships with investors and mission-focused organizations. Cinnaire provides creative loans, investments, and best-in-class services to partners. Find more information.